Following the service, food and fellowship will be shared. One of five children and the oldest daughter of girls, Stephany grew up in the countryside outside of Kalamazoo, where she learned to roam and play in the surrounding orchards and woods with her siblings from her early years. Even at an early age, Stephany had a finely honed internal clock for her favorite television shows. No matter how deep she was playing with her brother, sisters, and neighbor kids in the orchard, she always wandered home in time to watch “Highway Patrol” reruns at 5 PM. While Stephany was both amiable and amenable as a kid, she would not share the remote with her older brother when either “Little House on the Prairie” or “Walker, Texas Ranger” was on television. Stephany was born to David and Marilyn (Bassett) Anderson in Kalamazoo in 1960. Stephany began her schooling at four years of age at the John F. Kennedy Center for children with developmental disabilities in Kalamazoo. She spent over two decades at the Kennedy Center where she flourished under the attention of dedicated staff and made lifelong friends. Stephany’s parents were “super” volunteers at the Kennedy Center, and her sisters joined her in the center’s workshop during the summers. The Kennedy Center was one of the main social hubs for the Anderson family during Stephany’s tenure there. In 1968, Stephany was part of the inaugural group of athletes who met Eunice Kennedy Shriver when she visited Kalamazoo to welcome Michigan to the Special Olympics movement. Stephany participated in the local and state Special Olympics spring and winter games or programs for over forty-five years. She was an avid rhythmic gymnast and had the honor of representing her home state in cross-country skiing in the second Special Olympics Winter World Games in Vermont in 1981. Stephany also bowled for many years, where she and her friends were a regular fixture on Saturday mornings at Holiday Lanes in Oshtemo. As an adult, Stephany took golf lessons and played at many courses in the greater Kalamazoo area, including Grand Prairie, Eastern Hills, and Pineview. After friends and family, art and music played a huge role in Stephany’s life. She loved to color next to her sisters after school and enjoyed arts and crafts during summer camp. In her later years, Stephany began art classes at the Kalamazoo Institute of Arts where she worked in nearly all media. She particularly enjoyed painting and one of her works was selected for the cover of the 2012-13 MRC Industries annual report. Stephany also participated in the day program at MRC ArtWorks and sold her creations at Kalamazoo’s monthly Art Hop. For many years, Stephany participated in a chimes ringing program where she loved playing in the spring and winter concerts. Stephany enjoyed being with her family at home as well as being out on the town where she always seemed to run into someone she knew from school, work, Special Olympics, or her cultural activities. Stephany and her parents usually watched the CBS nightly news during the week, then would nibble on Dove Bars while they watched “Wheel of Fortune” and “Jeopardy.” Stephany would also sit quietly next to her mom and dad and work on one of her hundreds of word search books while they read. Even though she lived with her parents for most of her life, she was quite independent and especially helpful for them as they aged. Known for her winning smile and upbeat disposition, she was always encountering friends and acquaintances at any turn, whether it was around Kalamazoo or southwest Michigan, “Up North,” or along I-75 to Florida on winter breaks with her parents. Stephany knew the basics of American Sign Language and often ended a conversation by signing “I love you,” especially with her niece and nephew. Stephany exuded both warmth and enthusiasm to anyone she met. Stephany’s life was not always free, however, from insensitivity and sometimes ignorance due to a lack of acceptance from others, and she sometimes got upset when they displayed this. But she was usually not deterred by their prejudice and would often flash them one of her winning smiles, an unspoken challenge to them to think, talk, and act with respect. Her sunny, fun-loving spirit was an example to many in how she lived a life built on hugs, optimism, and compassion. And when all else failed, Stephany enjoyed the occasional strawberry daiquiri with family, friends, and colleagues at the end of a long day. Stephany was reunited with many of her childhood friends when she became a resident of Hoard Manor in 2013 where she was able to live with assistance from the professional, nurturing, and caring staff of Residential Opportunities, Inc (ROI). In addition to her mother, Stephany is survived by four siblings: Stuart, Kalamazoo; Susan (Doug Shulman), New York City; Sara (Bruce Gould), Chicago; and Sonya, Denver. She was a doting aunt to Ben and Eve Shulman of New York City. Stephany also leaves behind many Anderson and Bassett cousins. Stephany received exemplary attention in her final weeks from staff at both Hoard Manor and Hospice Care of Southwest Michigan. 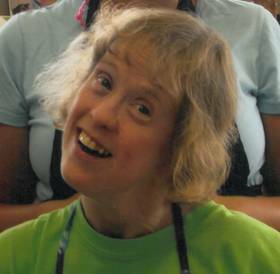 Stephany would have appreciated donations made in her name to Special Olympics Michigan Region 16, MRC ArtWorks, or ROI-Hoard Manor. Private burial took place at Genesee Prairie Cemetery. A celebration of Stephany’s life will be held at 1 PM on Saturday, February 18, 2017 at the Betzler Life Story Funeral Homes, 6080 Stadium Drive; Kalamazoo (269) 375-2900. A reception will follow the services. Her family welcomes condolence messages. Please archive a favorite memory or photo of Stephany and sign her online guestbook. Stephany would want you to know she loved you.